Freemynz – 1/2 Dozen Questions | Celebrity Plus-Again! Freemynz the duo……………….have you been introduced? No! Well then, let me make the introduction. 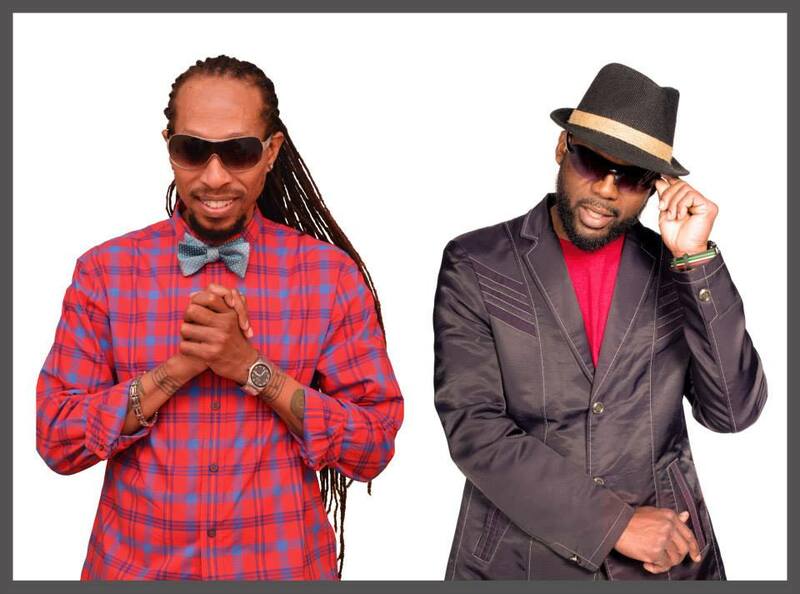 Shango Trex and Catapilla have not only been friends for decades, they have each worked on their individual careers, as well as collaborated on projects from Jamaica to Japan. Together, fans will come to know them as the duo, Freemynz. I caught up with Freemynz recently, and they graciously answered my “1/2 Dozen Questions”. Here’s what they had to say. Q. Freemynz is on a mission. How are you both? A. WELL, GOT TO SAY WE’RE STILL FEELING BLESSED, WHILE USING OUR MUSIC TO GET PEOPLE TO FREE THEIR MINDS & LIVE THEIR LIVES TO THE FULLEST WITH LOVE & CARE. Q. Your music…how would you classify it? I know you are not locked into a particular genre. A. YEAH, RIGHT ABOUT THAT (NO PARTICULAR GENRE). BUT NON THE LESS, WE’D CLASSIFY IT AS, FUN, UPLIFTING & INSPIRATIONAL. Q. Freemynz consists of two multi-talented artists, Shango Trex & Catapila, we know this. What many may not be aware of however, is how much you both have contributed in terms of spreading reggae across the globe. Tell us about this. A. FOR THE MOST PART, WE’VE BEEN OPERATING OUT HERE IN THE GLOBE FROM THE START OF OUR INDIVIDUAL CAREERS. FOR THE LOVE OF OUR COUNTRY AND CULTURE, IT IS NATURAL FOR US TO SHARE OUR HERITAGE WITH THE WORLD, WHICH WE ARE DOING WITH PRIDE. WE DID A CHARITY PROJECT LAST YEAR IN WHICH WE COLLABORATED WITH SOME OF JAMAICA’S MOST TALENTED ARTISTS. FOR US IT’S ALL ABOUT SPREADING OUR HERITAGE THROUGHOUT THE GLOBE. Q. As individual artists you both are phenomenal. What can we expect from Freemynz in the future? A. MORE MUSIC, MORE FUN, MORE INSPIRATIONAL VIBES & NON STOP GROWTH. Q. Are there any shows or tours planned that your fans can look forward to? A. WE HAVE A TOUR PLANNED FOR THIS SUMMER THROUGH THE FALL OVER IN ASIA. WE’LL BE PROMOTING OUR SINGLE, “THAT RUSH” AS WELL AS OURSELVES AS THE DUO, “FREEMYNZ.” WE ARE TELLING ALL OUR FANS WHO HAVE BEEN FOLLOWING US INDIVIDUALLY, TO LOOK OUT FOR OR ITINERARY, SO YOU CAN KNOW WHEN WE’LL BE IN YOUR TOWN. Q. Give us your social media links, and tell us anything I have neglected to ask that you would like to share. WE HAVE A SINGLE ENTITLED “THAT RUSH”, WHICH WILL ALSO BE AVAILABLE ON iTUNES, BEATPORT, AMAZON, AND ALL LEADING INTERNET STORES ON JULY 30TH, 2014. CD’S WILL BE DISTRIBUTED WORLDWIDE THROUGH “SOUND SYNDICATE INC. #904 2-24-13, KAMIOSAKI, SHINAGAWA-KU, TOKYO JAPAN 141-0021”. WE JUST WANT TO SEND A SHOUT OUT TO ALL THE PRODUCERS & ENGINEERS WHO HAVE BEEN WORKING WITH US. A SHOUT OUT TO “19BOX” LABEL FOR BELIEVING IN US & OUR WORKS, AND A SPECIAL SHOUT OUT TO OUR PAPA (ORIGINAL DADDY) “EDISON”, WHO IS A SPECIAL ADVISER TO US ALL THE WAY. There you have it. Be sure to stay tuned for much more from Freemynz. I will definitely be keeping you updated. Image | This entry was posted in 1/2 Dozen Questions, 1/2 Dozen Questions, 1/2 Dozen Questions, Feature, Interview, Music and tagged alternative, caribbean queen, david catapilla nevin, free, freemynz, jamaica, japan, minds, mumma shilo, reggae, shango trex, that rush. Bookmark the permalink.